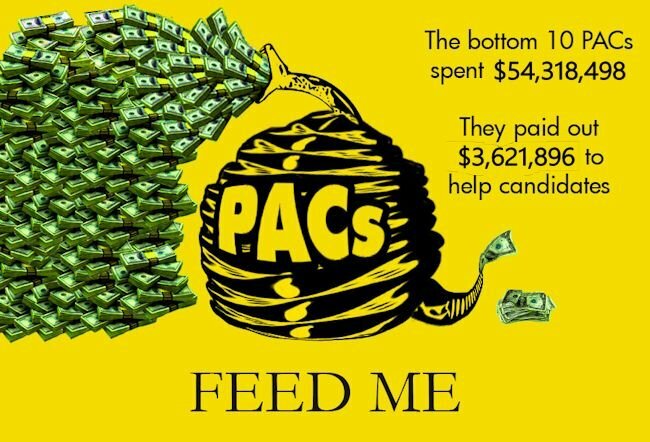 My latest PJ Media column is called, $50 Million Down the Tubes: How Conservative PACs Go Wrong. Here’s an excerpt from the column. This is how I imagine it all starts. You have an activist busting his behind to help conservatives and he thinks, “Wow, just think of what I could accomplish if I were able to do this full time!” Then, he manages to break the shackles of his day job and becomes a full-time activist running his own PAC. He’s living the dream! However, at that moment, he starts to realize that activism is now a job and his house payment, groceries and kids’ education all depend on it. Suddenly, his priorities start to change as an activist. It’s not just what’s best for the cause anymore; it is what’s the best thing he can do for the cause that gets him paid. It’s a subtle shift, a very defensible shift, but it sets the table for what comes next. Soon, he starts to realize that beyond the FEC ensuring that he’s sticking to the letter of the law, no one is checking behind him. People on his side of the aisle are very reluctant to write stories that make conservative PACs look bad and if a liberal puts out a story that makes him look awful, he can always say, “What do you expect? Do you think he’d tell you I’m doing a great job?” Then he hears about other people in the movement, the type of money they’re making and some of the things they’re getting away with. That makes it easy to rationalize. He tells himself, “Everybody does it,” and how can people get mad at him for engaging in something that’s standard operating procedure in the business? Next thing you know, an activist who started out with the best of intentions has begun looking at activism as just another job instead of a calling. As he becomes more cynical and jaded, maybe he raises money for candidates or events and never gives them any of it. Maybe his PAC makes millions and fills his pockets, but almost none of the money he raises goes to help conservative candidates and causes. Maybe he comes to look at activism as nothing more than another for-profit business. How bad were the numbers for the 10 conservative PACs on the bottom?